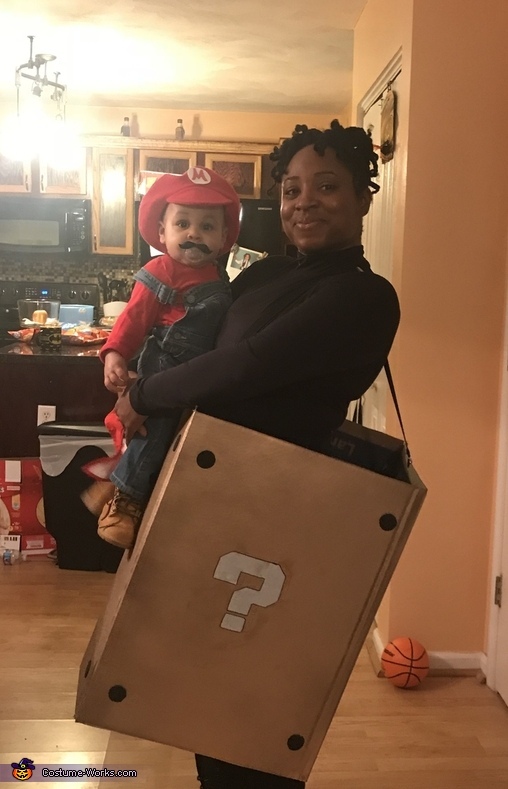 My son, Bailey and me, Akeisha, as Super Mario and the Prize Box. Th idea came from playing Super Mario as a kid. I made the box by spray painting a cardboard box with metallic gold paint and some black to give it a “rusty” look. I then made the question mark stencils and painted them on and outlined them with a black sharpie. The black circles were made with foam and I printed the mushroom and cut it out to glue on the box. All of these materials I already had on hand. My sons hat was made by his grandfather and the shirt and pacifier were purchased al costing roughly $11. It’s was an easy to do costume that didn’t cost much money.